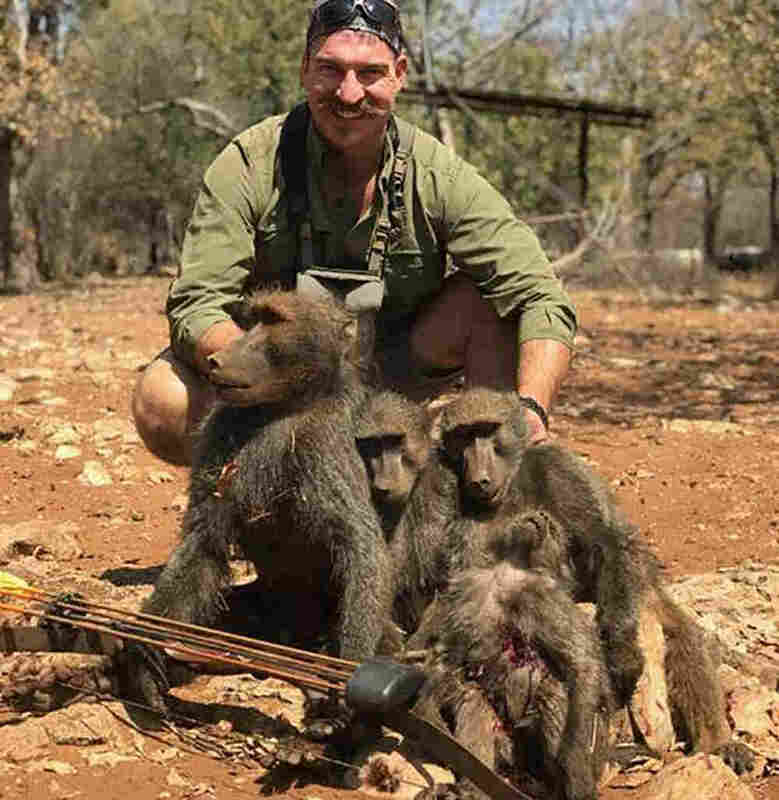 Idaho Game Commissioner Resigns After Killing 'Family Of Baboons' In Africa Blake Fischer was under intense pressure to quit after sharing photos from a hunting trip to Africa showing him posing with baboons he said he killed. Idaho Fish and Game Commissioner Blake Fischer has agreed to step down after sharing photos of himself in Africa posing with a "family of baboons" and other wildlife that he killed on a hunting trip. Idaho Gov. C.L. "Butch" Otter, who had reappointed Fischer to a new four-year term in June, "asked for — and has received — the resignation," his office said. Otter cited Fischer's poor judgment in sharing graphic hunting photos with more than 100 people, along with text that many found to be insensitive. In his resignation letter, Fischer agreed. "I recently made some poor judgments that resulted in sharing photos of a hunt in which I did not display an appropriate level of sportsmanship and respect for the animals I harvested," he wrote, according to Reuters. In his letter, "Fischer went on to apologize to the hunters and anglers of Idaho and expressed the hope that 'my actions will not harm the integrity and ethic' of the state's wildlife agency." In one of his hunting photos, Fischer smiles as he props up the heads of two baboons, with a young animal sitting in another baboon's lap. The photos are part of an email that was initially acquired by the Idaho Statesman through a public information request filed with the governor's office. Fischer was appointed to the commission by Otter. Early on Monday, the governor's spokesman, Jon Hanian, told NPR by email that Otter "is very concerned about these developments and our office is actively looking into this matter." When asked earlier for comment, a spokesman for the state agency told NPR, "Fischer was appointed by the governor and is not an employee of Idaho Fish and Game, so we have no comment on this matter." Fischer was one of seven current fish and game commissioners, representing Idaho's southwest region. He was appointed in 2014 and reappointed in June. Idaho's Senate was to decide whether to approve his second term when it meets in January. Several of the agency's former commissioners called on Fischer to resign. Fred Trevey, who left the commission in 2015, said that while he believes Fischer's hunt was legal, "legal does not make it right," according to an email response that the Statesman also obtained. Trevey added that the baboon image did not meet standards of sportsmanship. The controversy has been bubbling on social media. Facebook posts from both Otter and the wildlife agency on mundane topics were essentially hijacked by hundreds of comments — many of them calling for the commissioner to resign or be fired.